Westerns are back, though they have needed to find ways to adapt in order to survive the changing interests of audiences. Whether including comic book elements as Jonah Hex did, or noir aspects like No Country for Old Men, the western is back but it needs new ideas. Soon we will have cowboys fighting aliens, but an even better pair is the cowboys versus the ninjas. It makes sense when you think about it. Akira Kurosawa used the blending of east and west with the introduction of the pistol in Yojimbo, and the two have shared common themes which lent to counterpart cinematic remakes for ages. The Seven Samurai became The Magnificent Seven, but what would happen if the heroes of each of these film paired off against each other. That is what The Warrior’s Way sets out to discover. This is not a realistic portrayal, however. It is a bold and stylistic adventure, filled with graphically stylized violence and impossibly beautiful cinematography. This is the Moulin Rouge of ninja films. 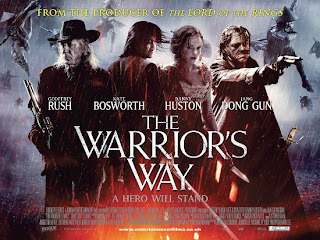 The story involves the world’s best swordsman (Jang Dong Gun), a man who has been trained to put all emotions aside and kill with complete accuracy. This is all destroyed when the assassin refuses to kill the last of his enemy clan, an infant girl. Instead he takes the child as his own and fights off the attacks of his own clan. As an outlaw from everyone in his world, the trained killer with no name hides out in a rundown town in America. Putting his past ways aside, he learns to live a simple life never before permitted. Violence becomes a thing of the past as he becomes a part of the friendly community of former circus performers and lost souls (including a drunken Geoffrey Rush and beauty Kate Bosworth). The small village was once a thriving town of entertainment, but this was all destroyed by a passing gang of outlaws. Soon the ninja assassin is forced to pick up his sword again, in order to protect his new family from a brutal tyrant (Danny Huston).